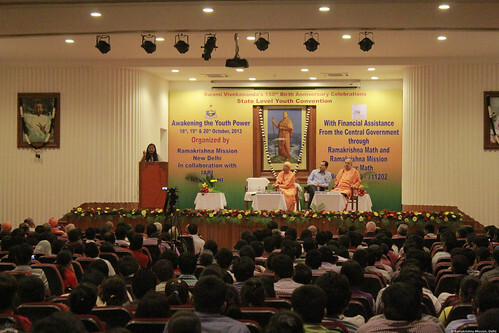 Ramakrishna Mission, Delhi conducted a three day State Level Youth Convention– ‘Awakening the Youth Power‘ from 18 – 20 October 2013. 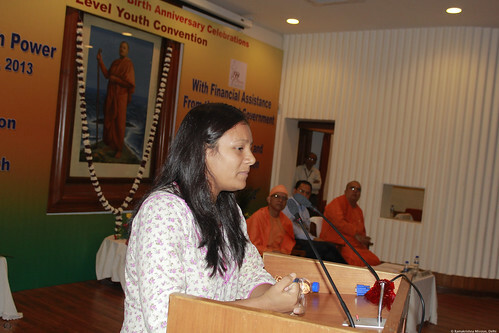 During a session titled ‘Inspired Lives (प्रेरित जीवन)‘ on the third day (20 Oct 2013), Ms. Arunima Sinha spoke in Hindi on ‘The triumph of human spirit’ (मानव की आत्मशक्ति की विजय). Arunima Sinha climbed Mt. Everest and became the world’s first woman amputee to achieve this feat. At the age of 23, when she was a promising national level sportswoman, she was pushed out of the general compartment of the Padmawati Express Train while resisting a chain-snatching attempt by some hoodlums. She had to undergo amputation of her left lower limb as a result. Her numerous achievements in mountaineering are triumphs of human spirit and courage over handicaps. She is currently in the process of starting a sports academy for physically challenged sports-persons.